With a novel style, "Huangpu River Light" is a combination of vertical water waves and water droplets. It looks like jumping notes on the staff, with a relaxed and cheerful melody, which plays the song of Huangpu River. "Sail" shows that the countless sails on the Huangpu River are heading for other places across China. In the sculpture of "Wind", acute angles and obtuse angles, arcs and fold lines are applied to show the reform and the fast development of China. In addition, you also can explore the Red Rock Monument erected by the British in 1860. The monument is the only physical thing preserved at the Bund. Monument to the People's Heroes and the Sculpture of Chenyi are situated at the Bund as well. The sculpture of Bund Bull is the symbol of the Financial Square at the Bund. 5.2 meters long and 3.2 meters high, the bronze bull weighs 2.5 tons. It was designed specially by Arturo Di Modica, the designer of Wall Street Charging Bull. 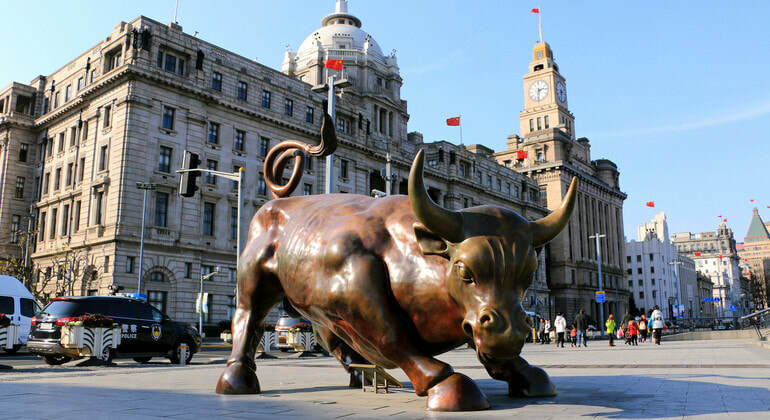 If you are planning to visit the Bund City Sculptures (Bund Bull) for photography purposes, the best time to visit is in the morning on sunny days. As the Bund City Sculpture Sculptures (Bund Bull) is located at the Bund, you can arrive at the Bund first and walk to visit the sculptures. There are several buses passing by the Bund. Therefore, there are several options. Rent a vehicle to the Bund. This is the quickest and most direct option. Take Bus 33, 37, 55, 65, 71, 135, 145, 305, 307, 317, 320, 330, 576 and Bus 934 to the Bund. Take Sightseeing Bus Line 1, Line 3 and Line 5 to the Bund. At weekends and on holidays, there can be countless tourists at the Bund. Therefore, it is not suggested that you explore the sculptures during the periods of time. Please take care of your belongings at the Bund. Interested in visiting The Bund City Sculptures on a Tour? Wendy Wei Tours offers a variety of different packaged tours as well as custom tours including The Bund City Sculptures, among other attractions and destinations. To find out more, please visit our Tours page or Contact Us directly to find out more.